This amazingly detailed image of Saturn's moon, Mimas, was taken by the Cassini spacecraft on February 13, 2010. 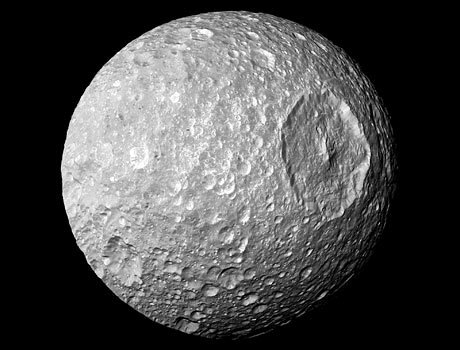 The most obviously feature on Mimas is the giant cratered named Herschel. This crater is so large it is surprising that the moon was not totally destroyed by the impact that created it. Because of this prominent feature, Mimas bears a striking resemblance to a famous planet-killing space station from a popular science fiction movie.